The Kepler telescope has led to the discovery of more than a thousand exoplanets. But there are still several thousand “candidate” planets. 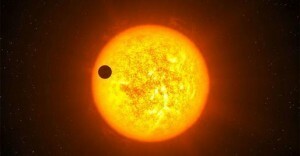 An exoplanet can be in candidate status for various reasons. 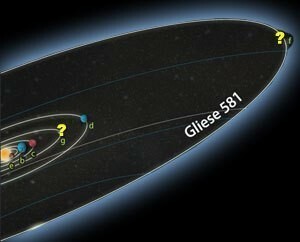 The data may not be solid enough to confirm the planet, or what looks like a planet doesn’t seem to have a stable orbit, or half a dozen other reasons. Sometimes the data might look good, but it’s just…strange. As an example, consider the data of an exoplanet known as KIC 12557548 b.
Kepler is not capable of observing planets directly. Instead Kepler gathered long term data on the brightness of about 150,000 stars. If a planet orbiting a particular star passes in front of the star (transits the star), then the brightness will dip slightly. So by looking at the brightness variations of these stars, we can look for transiting planets. So far we’ve found about 3,500 candidate planets in the data. The data on KIC 12557584 b was reported in the Astrophysical Journal. Like other candidate planets, the data shows a periodic variation in brightness. In this case the dips in brightness occur every 15.6 hours. The parent star of the planet is a K-class star about 70% the mass of the Sun. With an orbit of 15.6 hours, that would put the planet extraordinarily close to the star, with an orbital distance of about two stellar diameters. By comparison, the orbit of Mercury is about 40 solar diameters. What makes the data unusual is that the periodic dip in brightness is not consistent. The amount the brightness dips can vary from about 0.2% to 1.3%. This variation is far too much to be caused by a single transiting planet. So what could cause such a wide variation? The authors of the paper looked at several possible solutions. One idea was that the dip is caused not by a planet, but by a companion star with an accretion disk. As the accretion disk varies in orientation the amount of starlight blocked would vary, thus accounting for the fluctuation in brightness. But the observational data limits the mass of the planet to no more than three Jupiter masses, which is far too small to be a companion star. Such a mass is also too small to have an accretion disk. Even a ringed planet wouldn’t be sufficient to account for the variation. Another possibility is that we aren’t observing one planet, but two. A double planet of two Jupiter-sized worlds could account for the variation in brightness. When lined up they would block less light than when side-by-side. But two mutually-orbiting Jupiter-sized planets so close to the star would be unstable, so this doesn’t look like a good solution. A third possibility seems more reasonable. 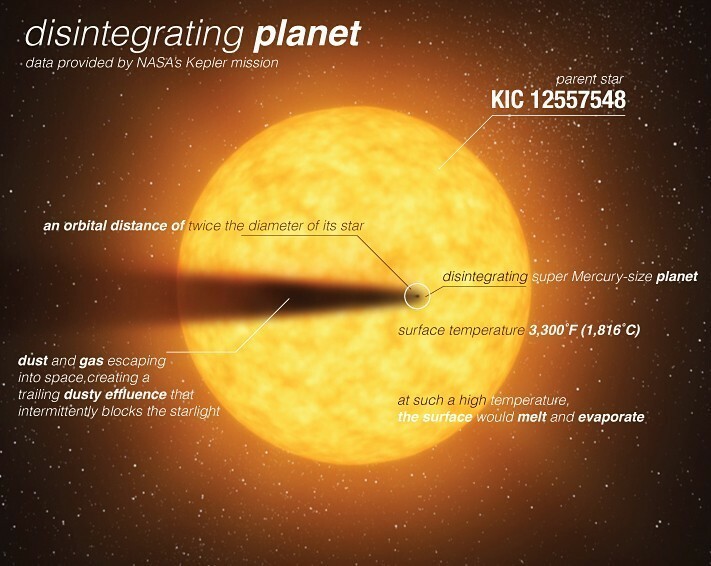 A planet so close to the star would be quite hot, about 1,800 degrees Celsius. If it is a small planet, then material from its surface could be boiled off, which would give the planet a trail of dust. The planet and dust would then transit the star, and variations in the dust would explain the variations in stellar brightness. For this to be the case, the planet would need to have a mass about 10% that of Earth (or two times that of Mercury). Much larger and the evaporating surface material wouldn’t be able to escape the planet’s gravity. If this is the case, then we may have found a dying planet. With its estimated mass and the amount of material loss, it would only be around for another 200 million years or so. As the authors point out, the dying planet model is both reasonable and agrees with current data, but proving the model will take more observational data. For example, infrared observation of the star to look for absorption features could prove there is indeed a cloud of silicates trailing the planet. For now it looks like Kepler has found a dying world. Further observations will either bring this planet into the confirmed column of exoplanets, or open the door to something much more strange.